I am by nature fearful. I have travelled alone with a knapsack on my back in some parts of the north and south of India for a period of six months in my purvasrama. An elderly saint in Gangotri told me, 'I see fear in you. How come someone so young is travelling alone?' I realised then that right from childhood, I had learnt to face fear rather than back out. In fact, I was taught to face fear. As a child, I was scared of dark places. My father would say, 'Find out what is in the darkness that you are afraid of'. I would then venture into the darkness and overcome fear. This attitude of facing fear (has still not made me completely fearless) but has made me adventurous, hold my own in a man's world, accept the worst case scenario in any circumstance, unafraid of being unpopular (which I am!) and enjoy solitude. Also, I was very fortunate to be in the company of a truly fearless divine person in the form of Sri Gurudev, Swami Chinmayananda. He reinforced my will to face fear and encouraged me to live in solitude. The Abhaya Vidya happened during one of my periods of solitude. I beg forgiveness of everyone for my audacity (dhrstata) for having written it in the style of an Upanisad. Upanisads are mantras revealed to Seers in their seat of meditation. They are not man-made and are sacred eternal Truths. I do not even dare to call myself a serious seeker, leave alone a Seer. I am grateful to all the great Seers for their revelations which inspired the style of Abhaya Vidya. This is only because, during that period of solitude I was doing parayana (reading) of the 108 Upanisads. Its influence was so strong that the words that emerged were in Sanskrit (of which I know very little), many words right out of the Upanisads and in the Upanisad style. This is only and only a creation for my own reflection and satisfaction (svantah sukha). For more than twenty years I did not show it to anyone except Pujya Guruji who kindly corrected the Sanskrit. During the Dharma Sevak Course in 2009 at Ahmedabad, I spoke on it for first time. It was liked by all, I believe, because we all have many fears in us. This gave rise to the thought of putting it into a book form. I am a student of Vedanta and Upanisads are the very essence of Vedanta. All thoughts in Abhaua vidua are culled out from the study of Vedanta. Many are the sentences directly quoted from various Vedanta texts. Continuous prostrations and deepest gratitude to Pujya Guruji for the opportunity to write again and again. This is an humble offering to Bhagavan Siva, who is my very own Self - free from all fear. May He be pleased and bestow true fearlessness. I thank Smt. Asmani, Bengaluru for the cover design and Sri T.B. Thakur, Tarapur for sponsoring the first print of this book. They have both always been a great support to me. May Gurudev's blessings be with them always so that they continue with the good work. All credit for the thoughts expressed goes to the Guru-parampara. All shortcomings are due to my limitations. It is important to understand a few basic principles of Vedanta. 'Veda' means to know or Knowledge. Vedas are eternal truths that govern the universe. They are not composed or invented. They are not even discoveries but are revelations. Rsis (mantra drastas) realised them either as mantras or know ledge in their seat of meditation. They taught them to their disciples who in turn meditated on them and passed them on to their disciples. They are also called srutis as they were heard by the disciples and passed on through the Guru-disciple-lineage (guru-sisya-parampara), Thus the Vedas are not man-made (apauruseya). Knowledge is eternal. It is neither created nor destroyed. It gets manifested with the thing created and becomes unmanifest with its destruction, like the law of gravity. Since the Vedas speak of eternal Truths, they are eternal (nitya and sanataria). The Hindu Dharma is therefore actually called Sanataria Dharma. The Vedas were compiled by Sri Veda Vyasa into four volumes called the Rg Veda, Yajur Veda, Sama Veda and the Atharva Veda. Each of us is born with three manufacturing defects. The first is the impurities of the mind (mala) like desires, anger, greed, jealousy. the list is long! The second is the distractions of the mind (viksepa). O! the wandering of the mind and how difficult to catch it even for a moment. The third is the ignorance of our own true nature (avidya avarana). We think we are a finite being whereas we are actually the infinite Truth! Each of the Vedas was therefore divided into three sections - Karma Kanda, Upasana Kanda and Jnana Kanda. 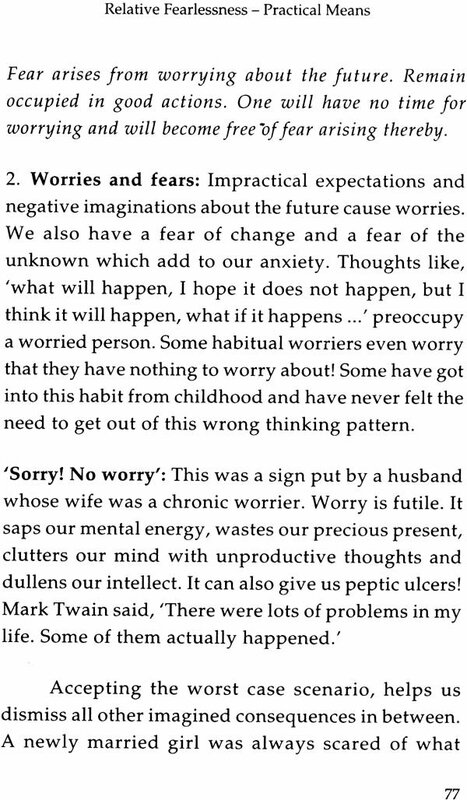 By practising the knowledge of the first two sections, we can get rid of the impurities and the distractions of the mind. The last section helps us to dispel ignorance. 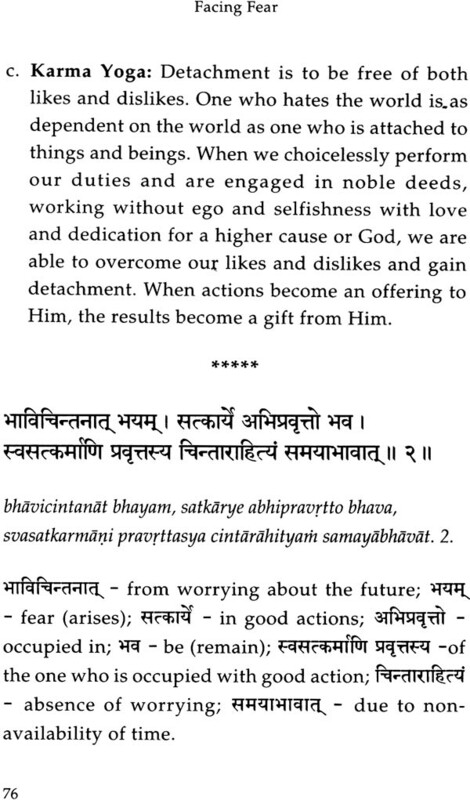 The first two sections give us knowledge of Dharma which ensures a harmonious life here, and a good life hereafter. The last section gives us knowledge of Brahman (Truth) which liberates us from the here and hereafter. The Jnana Kanda is also called Vedanta or Upanisad. 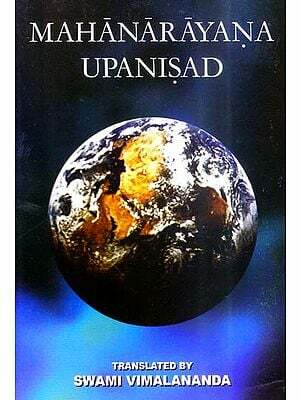 Upanisad means 'near-down-sit' (upa + ni + sad). It is the knowledge we attain when we approach a Guru and sit near him (upa samipe) with all humility and determination (niscayena). It is the knowledge of the infinite Truth (brahma-jnana.' atma-jnana) which exhausts the inherent tendencies (vasanas) of lifetimes, dispels the ignorance and reveals our true nature. In this world, there are two types of attainments. One is of the thing not yet attained (apraptasya praptih). When a thing, person, state or status is away from us in time and space, we can attain it through right knowledge and right action, like travelling to a destination or becoming a CEO. However the Self! Truth is one with us, already attained, but appears to us unattained (as we keep looking for happiness outside) because of ignorance. The only way to attain it is through Self-knowledge. It is not attained by any number of good actions nor is it the result of meritorious action, as actions and their result are both finite, whereas the Self is infinite. When the known object (prameya), the means of knowledge (pramana) and the knower's mind (pramata) are aligned, knowledge (prama) takes place. When the book is in front of us, and our eyes are open and the mind is awake and available, we read these words and understand! In case of Self- knowledge, the Self (prameya) is always available, ever the same, night and day. Thank God! The Self cannot be perceived through our senses or conceived through our mind or logically inferred. The Upanisads are the only valid means of Self-knowledge. Since the knowledge is extremely subtle, we need a Guru, who can teach us the right meaning of the scriptures. The best Guru is one who is well-versed in the scriptures (srotriya) and well-established in the Truth (brahma nistha). The second best is one who is well-versed in the scriptures as he can give us the right knowledge. Therefore the knowledge of the Upanisad or Vedanta given through the Guru is the valid means of Self-knowledge.